Should you get a regular rug or carpet squares for your classroom? While each option has its advantages, carpet squares are definitely preferable if flexibility is important to you. With the freedom to arrange and rearrange them as you like, you can do all sorts of activities with your students while they sit comfortably on the floor. 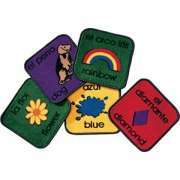 Classroom carpet squares come in vibrant solid colors as well as designs that include fun graphics. 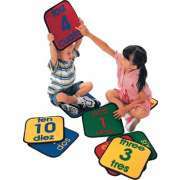 They can be used independently or ordered with matching full-size rugs, which allow educators to plan all sorts of fun and interactive activities around them. We even have designs that include two languages in each square for bilingual classrooms. Are carpet squares better than a full rug for a classroom? 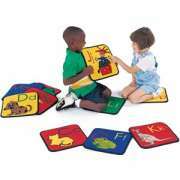 While regular classroom carpets do have their advantages, preschool carpet squares are the more flexible option by far. Rather than being stuck in one configuration that fits a particular area, they can be moved around and rearranged any way you like. Of course, if you want to make a standard square or rectangle that will still be an option. Giving students personal space in the classroom is very important. Each student is built differently and requires different positions to be comfortable. With carpet squares for classrooms, each individual has a clear space on the floor which can be arranged to their own personal liking. This is also helpful to the teacher who can ask students to arrange themselves in various configurations or groups of different sizes for a variety of activities. The possible arrangements are unlimited. 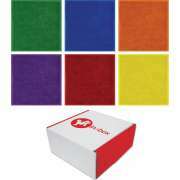 What kinds of classroom carpet squares can you get? 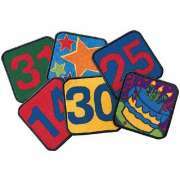 We have carpet squares for kids in a number of different designs. Solid vibrant colors brighten up a learning space and work well with many different themes and styles. You can use different colors to split little ones into groups or ask them to make patterns based on the colors they have. We also have bilingual carpet squares with graphics labelled in two languages, as well as phonics squares, alphabet squares and number squares. 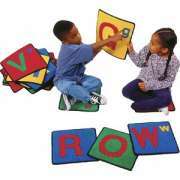 What activities can you do with classroom carpet squares? Sitting squares can be used for a whole lot more than just sitting. You can place them around the room and ask students to do different activities at each station. You can play matching games with the squares and pictures around the room or a full-size classroom carpet with a coordinated design. 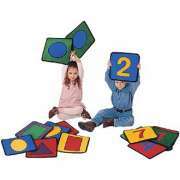 Children can be asked to find a particular square or a square with a certain letter on it. These are just some suggestions of the many options you have for educational games and exercises based around classroom carpet squares.